In Egypt, PP players have been reporting tight PP supplies in the local market for some time while they highlight the fact that PP film supplies have been the shortest, according to ChemOrbis. The domestic producer EPPC’s raffia prices have been absent since March as the producer has been suffering from some delays when delivering their goods to their customers. Back in March, a source from the company had revealed that they had not announced any March prices to the market as they were still trying to deliver their February cargoes, which had been hindered due to some documentation related bureaucratic issues. Last week, a source from the producer had noted that they overcame the obstacles they faced and that they might be offering PP for April. “However, our April presence will depend on our availability because we do not hold much stock,” he further added. Apart from EPPC’s absence, Middle Eastern PP prices were announced higher for April, on the back of the limited availability from the region, adding to the tightness. Although the Egyptian pound has recently stabilized, Egyptian players had been struggling with the constantly increasing US dollar parity which was exacerbated by the Central Bank’s attempt to curb black market trading of the currency. They were also facing difficulties when trying to open letters of credit at banks. Such factors, combined together, restricted import purchases and players mostly turned to the local market to meet their needs. As a result, local supplies started to dwindle and prices of the locally held cargoes moved up. 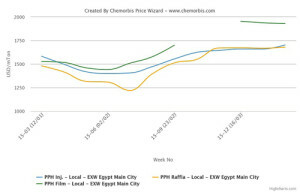 In the distribution market, the most recent locally held raffia and injection offers signaled EGP1000-1900/ton ($131-249/ton) hikes when compared to end February levels as per ChemOrbis pricing service. 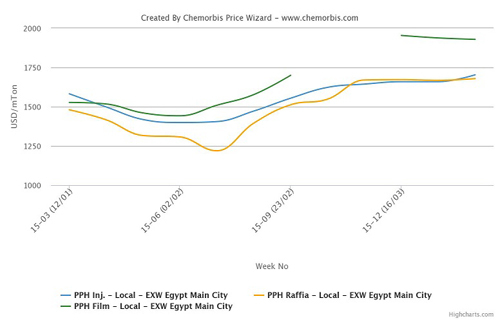 However, locally held PP film prices indicate EGP1900-2000/ton ($249-262/ton) hikes over the same period. Currently PP film carries a very large premium over the locally held raffia and injection offers at EGP1900-1200/ton ($249-262/ton). A film products manufacturer operating in Alexandria commented, “Despite weak demand, we anticipate further hikes given the higher announced import prices and tight supplies. We do not find the hike amounts reasonable but we see that players feel obliged to purchase in order to run their business.” However, some players also commented that they have reduced their operating rates to 30-60% capacity in order to overcome the weak demand and increasing prices.